Wow, I'm always amazed at how fast the $100 Room Challenge seems to fly by. It's week three since I started refreshing our kids bathroom to accommodate a new little member to our family, our baby girl is due early next month. I'm quickly working away trying to get this bathroom ready in time before her arrival! Check out week one and week two posts where I detail out my plans and show some inspiration pictures of the look I'm trying to achieve. This week, I'm focusing on all things accessories and organization to ensure that I have a functional space for my kids and overnight guests. I started by heading to the Dollar Tree for some organization supplies to help me tackle underneath the sink. If you follow my blog, then you know that I like to be pretty organized. But if I'm being honest, this little area underneath the sink has been a mess since the day we moved in. I simply tossed things in and never looked back! I purchased three different sized baskets at the Dollar Tree to help me corral everything together. A big white bin to hold all the cleaning supplies so that they are ready should anyone need them. (Don't worry, the cabinets are already child proofed so little hands can't get in here). I then used a smaller blue bin to help me keep extra toothbrush supplies for my littles. The rest of the bins are all for guests, should they forget something, there are sample size bottles of everything from soap to shampoo and conditioner. 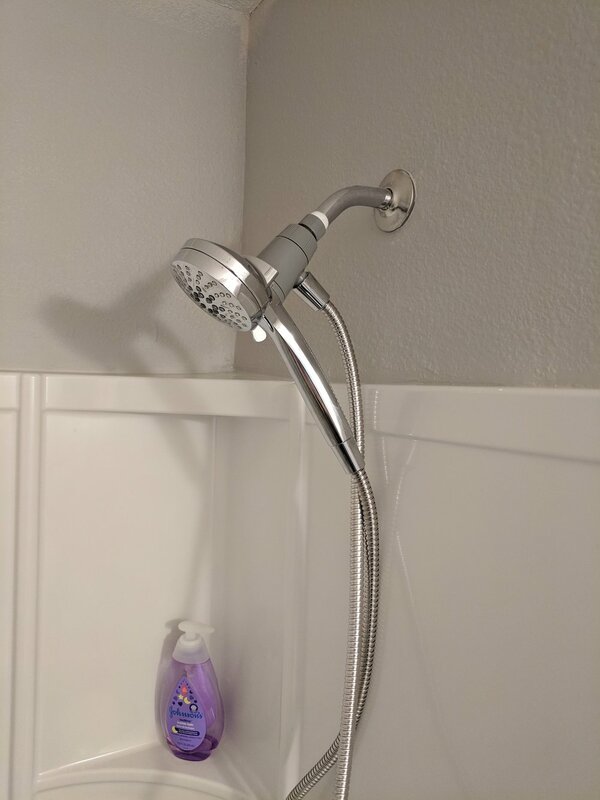 When guests do stay over, I like to set out some of these products in the shower so that they are ready for them to use. But since this is mainly the kids bathroom, I like to keep this stuff stored away until we need in order to reduce that visual clutter. I also added two small baskets to each drawer next to the sink. One for our baby girl and the other for our little guy. This is where we keep all of their supplies that we use every day, like hair brush, tooth brush, toothpaste, etc. It's amazing what a little organization can do and it's already looking a million times better than it ever has! While organizing the space underneath the sink, it's like Christmas all over again finding things, new and old, that I haven't seen in years. Like an old rain shower head that we had planned on switching out but haven't gotten to it yet. I had every intention of cleaning it up with vinegar and using it in this bathroom, but my mom was kind enough to gift us for Christmas a removable shower head so it would be easier to clean and wash the kids. Thanks mom! I also found a brand new toilet paper holder that I bought when we first moved in but never installed in this space. We've been using a stand up toilet paper holder that's just not working properly. It tips over every time you use it and it's just not pretty. So we'll be updating that as well! See the theme around here? We were so excited when we first moved in and started buying all this stuff that just ended up sitting underneath the sink never to be seen again! While I'm making over this bathroom, I'm also painting the hallway just outside between the bathroom and two kids bedrooms that was still in our old house color. In order to do something fun for these walls between the two bedrooms, I've created a little gallery wall where I'll display all our family pictures. I have one frame left over that I'll be using to add to the bathroom decor. A simple picture of a pineapple that I downloaded for free and printed off myself. So easy! One of the big changes that I'm making to this space is by changing up the shower curtain. I wanted to elevate the space by switching out my current shower curtain with one that's more like window treatment that can be hung a lot higher. This will make the small bathroom without a window appear taller and grander! I've been searching for just the right curtains to incorporate in this space and decided to stick with what I know works. Blue and white stripped curtains, basically the window treatment of what I used to have as a shower curtain. I like the white because as I mentioned, there is no window in this bathroom and I don't want to make the shower area super dark. Another plus is that I'm taking them from my sons room because we are in the process of updating his space. Thank you for subscribing and WELCOME to the House by the Preserve tribe! Check your email to confirm your subscription to be sure you are in the know!